The MAG C115-300 1 x 15" combo features a potent new fan-cooled 307 watts RMS power section. Rotary bass, middle and treble controls are supplemented by smaller rotary controls providing 15dB of cut and boost at 220Hz and 1.6kHz, providing a comprehensive 5 band EQ section. 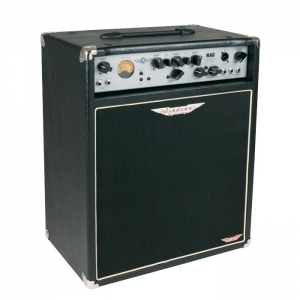 Additionally, front panel push switches for Bright and Deep settings provide instant access to attacking and warm, rounded sounds respectively and, on the subject of low-end response, the trademark Ashdown sub-harmonic generator is ready and able to deliver truck loads of earth moving tone if called upon. Inputs are provided for active and passive instruments and the front panel also features an effects send and return, a tuner/line output and a balanced DI output for direct connection to a mixing console. All MAG combos have extension speaker outputs and are loaded with Ashdown BlueLine speakers for exceptional attack, clarity and low-end performance. Protection is provided by tough black carpet covering and new steel grilles, while the amplifier chassis is constructed from light yet strong, heat-dissipating magnesium alloy for ‘roadie-free' portability. And, of course, the famous Ashdown VU meter remains central to the cool look of these great, value for money bass amplifiers.